The exhibition at the Musée Jacquemart-André will no doubt confuse more than one art historian for its subject. In fact, it is so original that it has us quite perplexed. The exhibition’s main goal  is “to provide an account of the importance of the Flemish current in France in the early 17th century”. This point, so far, is not debatable except for the fact that this is nothing new. Is the question treated satisfactorily ? We will see this further on. 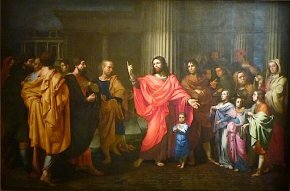 The show then focuses on the “new pictorial models developed in France by Nicolas Poussin, Laurent de La Hyre, Eustache Le Sueur and Charles Le Brun […]”. Why not, although we do not see how this ties in directly with the first statement. Also, saying that Poussin “develops his art in France” seems a bit like stretching the truth since the artist, who moved to Rome in 1624, spent barely two years in Paris between 1640 and 1642. The third assertion, and conclusion of the exhibition, is an established fact already as well : “the artists in the Belgian provinces and most particularly those in Liège, such as Bertholet Flémal, Gérard de Lairesse (ill. 1)…” did indeed adopt the “new pictorial models” developed in France. None of this is new, but suggesting that this is a “reversal of the influence […] which transpired between the two schools during the 17th century” takes a fascinating, and misleading, shortcut through art history. First of all because the Flemish influenced French painting far beyond the first half of the 17th century as reflected by the polemic between the supporters of Rubens and those of Poussin, which ended in a victory for the former but which is not at all presented in the exhibition, nor in the catalogue. Second of all, associating Flémal, Damery, Lairesse to the Flemish school seems very presumptious since the principality of Liège, which is French speaking, the central province of future Wallonia, is not Flemish in the strict sense of the term, either linguistically or politically. Indeed, at that time it was independent. In short, the exhibition’s underlying thesis is both overly complicated and objectively false. There was no “reversal” between Flanders and France, at least not in this way. Unfortunately, the visit offers a number of other similar approximations although there are many beautiful paintings to be found in the rooms. The first of these highlights “Rubens et Baroque taste in Paris”. The canvases on display do a fine job of illustrating this aspect of the question. We do however regret the hang of the Adoration of the Shepherds ascribed to Rubens, held in a private collection. Although the attribution, still debated and in our opinion, debatable, is perhaps exact – according to several specialists – it is not really on a level with the quality of one the greatest painters in history. 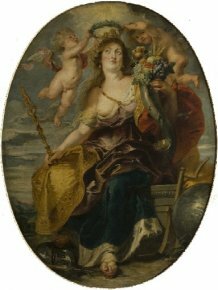 Most of all, it does not tie in with the subject in any way as this is a work (oil on paper) from the late Italian period, datable to 1606, for which no example was visible in Paris and of a very different style from that which Rubens would produce a few years later. As for the Allegory from Blois (ill. 2), there is no way that this work can be acknowledged in all certainty to Rubens as stated on the sign, whereas the catalogue is indeed much more cautious. According to recent authors, it should be attributed to the workshop or a close follower. One can always legitimately suggest a new attribution but should do so only with certain precautions when it is not widely accepted. 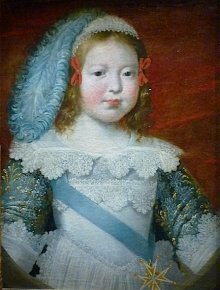 The same applies to the Portrait of Louis XIV, as a Child (ill. 3) for which Charles Sterling had put forth the name of Claude Deruet as early as 1934 , which has never been seriously contested since. It is presented as “Philippe de Champaigne”, without qualifying it as “attributed to” (which should even be “attributed here to”). We do not think (and we are not alone) that “the name of Champagne is obvious […]”. The second room is undoubtedly one of the best. The juxtaposition of a Snyders and La Hyre d’Arras with Two Dogs in a Landscape is very convincing. There is no question that the French painter did indeed see many Flemish examples available in the capital. 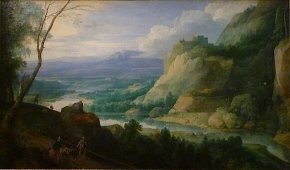 Visitors will also be able to admire the very beautiful landscape by Jacques Fouquières (ill. 4), a rare artist, active in the project for the Luxembourg, and in fact of Flemish origin. The third room remains a mystery. On the one hand it is easy to say that Liège is not Flemish, but it is hard to assert on the other, that Holland is. Yet, we cannot really see any Flemish influence in the Le Nain brothers as is the purpose here with paintings which are in fact of a very different atmosphere. True, Téniers is Flemish but the Le Nains find much more inspiration in Dutch genre painting, and of course, Caravaggesque art, if we were to fall into the trap of playing this little game of “influences” which is not really very interesting and certainly should not be an end in itself. Indeed, in his introduction, Nicolas Sainte-Fare-Garnot recalls quite rightly that Mariette described the Le Nain brothers as “bambocheurs”, named after Pieter van Laer, a Northern painter but Dutch. The fourth room presents several paintings of very fine quality, falling in the vein of what is now elegantly termed “Parisian Atticism”. Art lovers are already familiar with Solomon’s Judgement by Laurent de la Hyre (ill. 5), currently on the art market, but they will also be able to enjoy a Pierre Patel, Landscape of Ruins with a Shepherd (ill. 6), not often seen as it belongs to the bank, BNP Paribas. The fifth room, about Poussin in Rome, is also off the subject and not very interesting. Some of Poussin’s most mediocre works are assembled here such as the Pietà from Cherbourg or the Mercury, Herse and Aglaurus from the Ecole des Beaux-Arts. The painting from Caen, of better quality, or the one from the Musée Fesch are still secondary works nonetheless and this group of Poussin canvases do not really do him honor. Visitors will much prefer the two in the next room even if the Andelys painting and The Storm from Rouen are often found in exhibitions. Rooms 7 and 8 are the high point of the show and a good reason to come because Liège painting is not well known in France despite the close ties to our country. There are several works from the same private collection, that of Albert Vandervelden. The French influence on these painters is undeniable. 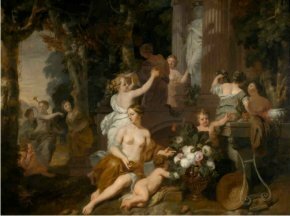 There is a superb Portrait of Cyprien Regnier d’Oostergooer by Gérard Douffet, painted in Utrecht but in this case, very Flemish in manner ; a Bacchanale with the Triumph of Bacchus by his student Bertholet Flémal, obviously "à la Poussin" as is the Classic Landscape by Walthère Damery, who did the décor for the cupola of the church of the Carmes, rue de Vaugirard in Paris as our readers may recall ; an ensemble of eight large studies in camaieu (monochrome) by Gérard de Lairesse (no doubt a student of Bertholet Flémal) representing The Triumph of Paul Emile and also Christ Gathering the Little Children around Him (ill. 7) by Jean-Guillaume Carlier, another of Flémal’s disciples. We would like to conclude our review of this exhibition on a final point which calls for reflection. We have always considered that it was perfectly legitimate for art dealers to contribute to art history. Some even do so brilliantly and we regularly comment here on the exhibitions organized by some galleries who add much to the discipline. But when the show takes place in a museum, there should never be even the slightest confusion of interest. Yet, one of the two curators here, Jan de Maere, is an art dealer, a fact which is not stated anywhere and it is not clear if the paintings from private collections are in any way associated with his business activity. This would not be very serious if all the attributions were absolutely acknowledged for sure… This ambiguity, perhaps not reprehensible in itself, is nonetheless a bit troubling. Under the supervision of Jan de Maere and Nicolas Sainte-Fare-Garnot, Du baroque au classicism. Rubens, Poussin et les peintres du XVIIe siècle, 2010, Fonds Mercator, 223 p., 45€. ISBN : 9789061539742 (paperback), 9789061539735 (bound). Visitor information : Musée Jacquemart-André, 158 bd Haussmann, 75008 Paris. Phone : 01 45 62 11 59. Open every day from 10 to 18, until 9.30 on Mondays. Rates : 10€ (full price), 8.5€ (reduced). According to the press release which, for once, we consulted along with the catalogue. This is not “recent”, as written in the catalogue.